Being recognised as the Best Small PPC Agency in Europe was a huge achievement for us. Since then, we have been building on our success to become the BEST and biggest PPC agency. We may be one step closer to our latest award nomination at the Recommended Agency Register (RAR) Digital Awards. The Recommended Agency Register (RAR) exists to help brands choose agencies, based on ratings. The RAR database contains over 55000 ratings left by brands. Every year, RAR analyse the ratings from their database to recognise which agencies are the highest-rated by clients for digital services. 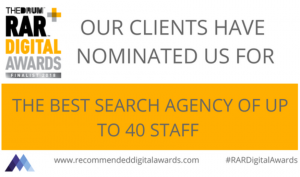 As a specialist PPC management agency, we are very proud to be nominated for the best search agency of up to 40 staff. Being nominated for these awards is a huge achievement for us, as they are one of a kind in the industry. Winning can only be achieved through the high regard of clients, showcased by the ratings on recommendedagencies.com. There are no entry submissions to write, no forms to fill in, the results are purely based on performance and recognition within the industry. That’s what makes this nomination different. The results will be announced at the RAR Digital Awards ceremony on the 19th June. Being nominated is recognition in itself, but to win would be even better. Congratulations to all those shortlisted and best of luck for the results! Your AdWords advertising could be managed by the best specialist agency that Europe has to offer. Why not speak to a member of our award-winning team to see how you could achieve better results through PPC advertising.